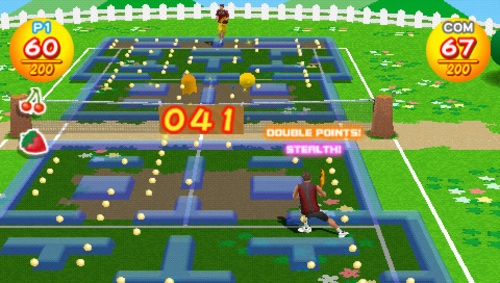 Gamedrop: Pac-Man Gets Tennis Elbow! 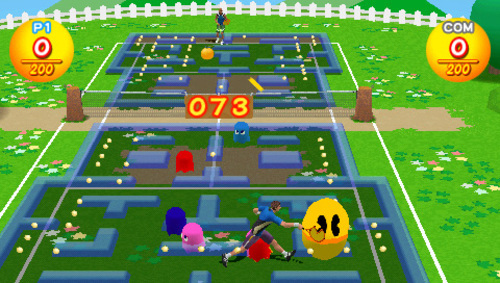 In 'Pac-Man Tennis,' Pac uses his his round shape to his advantage and becomes the ball. You serve him, volley him, and do your best to get him to eat as many pellets as possible as he goes back and forth over the net. The more pellets he eats, the more points you get as long as you win the point. It’s pretty fun. I spent a little hands on time with an early build of the game, and despite my partial soft spot in my heart for the yellow guy, the game really is pretty fun, and a great new direction for him. Pac-Man Baseball... where he's the ball. Pac-Man Basketball... where he's the ball. Pac-Man Hockey... where he's the puck. Pac-Man Cricket... where he's the ball. Also included in Smash Court Tennis 3 is a version of 'Galaga Tennis' which I didn’t get to play, but I assume it may have something to do with killing flying 8-bit bugs with your tennis ball. Yeah, awesome.